Lois Brown from Furnace Mill Fishery, near Kidderminster, caught this 33lb spring Salmon (44in long!) at the Ballathie beat on the River Tay. Head ghillie George McInnes manoeuvred the boat over a likely spot in the Blackstones pool when the fish took. 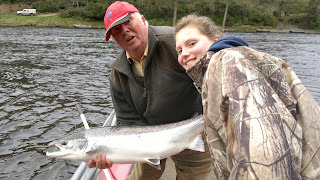 Lois' father Ed, an experienced angler himself, could only stare in disbelief and admiration when his daughter hooked her first ever salmon, a fish of a lifetime! The fish measured 44 inches long (estimated at 33lb) and was safely returned.